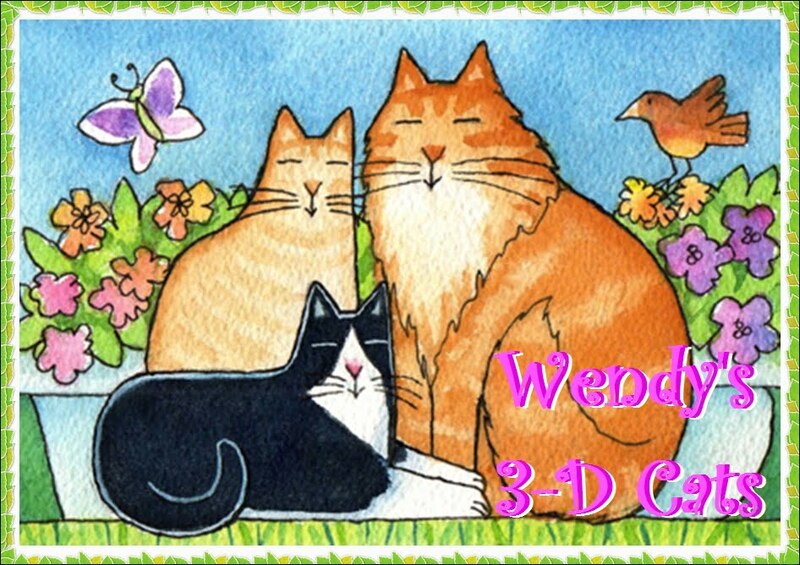 Wendy's 3-D Cats: TUXY TUESDAY WITH DOMINO: HOSTESS WITH THE MOSTEST! TUXY TUESDAY WITH DOMINO: HOSTESS WITH THE MOSTEST! Before Grampa passed, we had a birthday party for one of my lady furiends, Susan. Domino dressed up in her best party dress and acted as hostess. She was there to greet the guests, entertain them a little before dinner and then to wish them goodnight in her own peculiar way. Before the guests arrived, Domino is checking out the venue to make sure everything is ready. "Doan touch dis PURResent, Mama! Is NOT fur yoo!" Domino positions herself in the PURRime greeting spot. And none too soon, because here's the birthday girl herself -- Auntie Susan! ... who scoops Domino up and tries for a cuddle. "Not now", says Domino. "Lemme go -- I gots moar work to do!" And just then Auntie Val makes her appearance! Auntie Val had a birthday card for Mama even though Mama's birthday was in October ('cause Auntie Val missed it). The card was mesmerizing to Domino because when you opened it, many cats would sing "Happy Birthday" in catspeak, of course. Meow meow meow meow, meow meow"
Domino checked that card upside down and inside out, but she couldn't find where they hid the cats. So FURustrated, she gives it the back of disrepect. "I think it got wind of my disapproval, if yoo gets my drift", says Domino. ... but settles instead on the enticing aroma of Auntie Val's feet! Domino is a sucker when it comes to socks seeped in human scent. So, Domino waits while all the ladies enjoy their dinner. Daddy has now taken over the task of waiting on them hand and foot at the dining table (although Domino did a pretty good job with Val's foot just a moment ago). Domino thought she'd take a little nap in the meantime. She deserves it after all that hard work. ... and doesn't notice when efurryone tiptoes out the door at evening's end. He looks so happy in these pictures with the cats! Wonderful memories, my condolences to you and your husband. Oh Domino you are the perfect hostess and you look so pretty in your party dress!!! Domino, no wonder you fell asleep, exhausted. Hostessing is hard work and you do it exceptionally well! Domino! my heart sings every time I see you in one of your dresses! You are the princess in all my dreams! Domino, you're quite the hostess and the belle of the ball! We are sorry about your Grandpa. 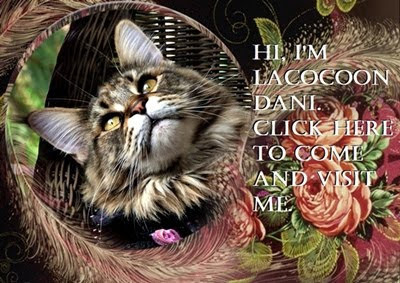 Please accept our condolences and purrs. What a lovely party you had. We loved the pictures of Domino in her fancy party dress! What a pretty dress! Sounds like a fun party. It's hard work throwing a party, isn't it, Domino? YOU are the hostess with the mostest! And the cutest too. You did a great job hostessing, Domino! And you looked so pretty in your pink party dress! P.S. Mama really loves that gorgeous stained glass lamp by your fireplace! WE are so sorry about Grandpa. It sounds like some of his life was good especially if he got attached to Dante and Dante returned the favor. A gigantic Happy Thanksgiving to all of you. We need a Dante fix soon. Domino, you sure make the purrfect hostess. We love you doing all your greeting duties with your cute little dress on. Have a great day. Domino- You were quite the fancy little hostess! I am imPURRessed with that fancy frock-with pink satin rose you wore the entire evening. I'm sure that the party was splendid. Those are all great pictures pretty Domino, but that last one is way too cute! Aw, how sweet, Domino! We can't believe any kitty could wear a skirt for so long! There would have been lots of blood to clean up here.